Hand-built to its original 1970’s specifications, the Neve 33609 Stereo Compressor offers comprehensive limiting and compression facilities for music recording, mastering, post production and broadcast applications. The combination of hand-wired transformers and gain reduction circuitry produces a sound quality which is often duplicated, yet seldom achieved by any other compressor / limiter. 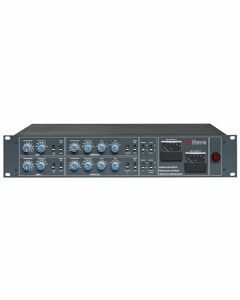 The Neve 33609JN Stereo Compressor dispenses wide-ranging limiting and compression capabilities for music recording, mastering, post production and broadcast applications. The unit’s unmatched ease of use combined with its inimitable sound superiority has made the 33609 a global studio standard for more than 30 years. Couple this with the amalgamation of hand-wired transformers and gain reduction circuitry and a sound quality which is often duplicated, yet seldom achieved by any other compressor / limiter, is produced. The 33609 makes use of autonomous sidechains for the compressor and limiter sections, with similarly independent threshold, recovery and attack controls. A selection of ratios from 1.5:1 to 6:1 and a gain make-up control that comes before the limiter are showcased by the compressor. Overall gain reduction is indicated on a moving coil meter. The trademark Neve 33609 compression sound is extraordinarily even, and radical settings may be used with the compression or limiting remaining relatively unapparent. Over the years we’ve seen several versions of this Neve compressor, today's 33609 creates a perfect mixture, cherry picking the best components of each iteration. Original legendary Neve 33609 sound, with boosted internal and external I/O switching balanced against the initial model. The Neve 33609 also employs a discrete output stage like the original model, creating a slightly livelier sound that is favoured by countless experts over previous instalments. Multiple units can also be simply connected for multi-channel operation. The Neve 33609 Stereo Compressor is often called a "desert island" compressor. Much like its relatives, the classic 1073 and 1081 microphone preamplifiers, it is a compressor that a healthy selection of the Earth's top engineers and producers would choose above all others. Frequency Response: 20Hz to 20kHz +/-0.5dB, measured at 0dBu relative to 1kHz. 55dBu with compress IN and gain make-up at maximum. Limit Level: +4dBu to +15dBu, measured with limit recovery set at 50ms, level at +8dBu using a 1kHz sine-wave at +20dBu and +8 control adjusted to give +8dBu output. Limit Ratio: with input level at 10dBu, increased to +20dBu the change in output level should be 0.1dB, +/-0.1dB. fast: 2ms, +/-1ms being the time taken for a signal to return to within 1dB of its original value, using an increase in input level of 10dB on an input adjusted to +10dBu at 1kHz. Limit Recovery: 50ms, 100ms, 200ms, 800ms, AUTO 1 1500ms, AUTO 2 3000ms (all +/-50%). Gain Make-up: settings 0 to 20dB correspond with output level +/-0.5dB.